As a lover of chocolate, from mouth-coating white to my (slightly) obnoxious love for the dirty bitterness of 90 per cent dark, I have a confession: I bloody love Easter eggs. I don't know if it is a hangover from my childhood but there is something about the cheap chocolate, the coloured foil of eggs from the supermarket aisle, the pastel speckled bird's eggs, whichever and whatever way, I'll eat 'em. 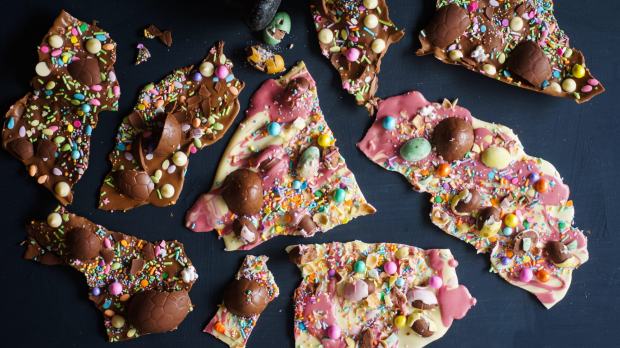 In celebration of all things Easter and all things minimal effort, so we have time to enjoy the holiday, here are two too-easy treats that celebrate all that is good, and indecent, about Easter chocolate. Here your bog-standard Easter egg has been upscaled with a hefty dose of mascarpone, dulce de leche and sea salt. A five minute salve for all your creme egg needs and not as sickly sweet as the original can be. 1. Carefully remove the top off each Easter egg – hold the base of the egg in one hand to keep it steady, pierce the side of it with a knife, then gently cut through. If the chocolate cracks or crumbles, try with a different knife (serrated or straight blade). 2. Using a teaspoon, gently fill the eggs to just below the rim with mascarpone. Pop in the fridge for 15 minutes, uncovered, for the mascarpone to firm up slightly. 3. 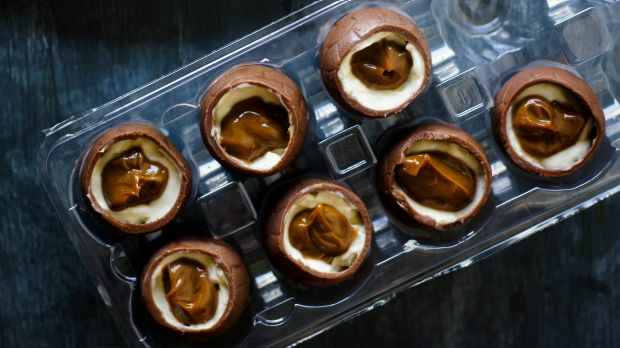 Remove and gently top the mascarpone inside each egg with half a teaspoon (or to taste) of dulce de leche. Sprinkle with salt (if using) and serve. Make ahead: Filled eggs can be stored covered in the fridge for two days. I've given a rough guide for the chocolate here but feel free to use as much or as little as you like and go rogue with the toppings. I used white and ruby, it looks lovely, but you can use any combination of colours. 1. Place a heatproof bowl snugly over a saucepan with a little water in the bottom (but not enough that it touches the base of the bowl). Bring to a gentle simmer, then lower the heat and start breaking your chocolate into the bowl, working with one type of chocolate at a time. Stir with a spoon or spatula until smooth and completely melted. Set aside the bowl. 2. Place another bowl of chocolate over the simmering water until it melts, then repeat process with remaining chocolate colours (each in separate bowls). 3. Line a baking sheet or thin tray with baking paper. Pour one bowl of the melted chocolate onto the lined tray and spread evenly using a spatula. 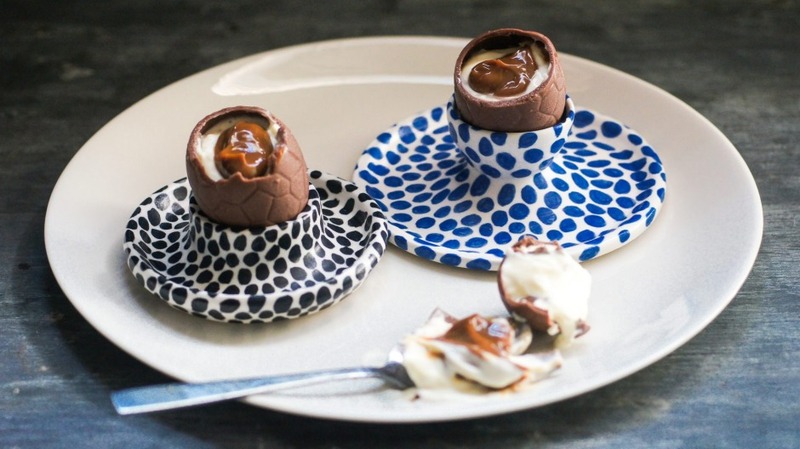 Repeat with other bowls of melted chocolate to create sections and layers of different colours – swirl with a skewer for a more marbled effect. Make it as thin or as thick as you like, but about half a centimetre is a good thickness for snapping the bark into shards. 4. While the chocolate is still soft, add your toppings. Transfer the tray to the fridge for a few hours to set. Once completely set, break into rough shards.